Retelling the story of Yoshi's Island, Kamek has ambushed the stork carrying Baby Mario and Luigi, but dropped Mario in the process. You begin with Baby Mario falling through the sky. Using the stylus, draw clouds to guide him safely through the obstacles and enemies to the ground. Drawing bubbles around enemies will turn them into Coins. Capture multiple enemies inside a bubble and they will be worth more. Baby Mario will land on Yoshi's back. 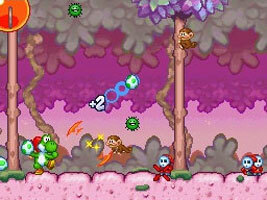 Yoshi walks forward automatically, and you must draw clouds and bubbles to help him avoid enemies and traps. By tapping the screen, Yoshi will throw an egg in that direction. Eggs will rebound off walls and can be used to hit difficult-to-reach enemies. When you get a high score, you have to enter an icon instead of your name. There are three groups of icons to choose from: the second set is a lineup of characters, enemies and items from the Mario series, and the third set are 8-bit sprites of the same characters, enemies and items as they appeared in Super Mario Bros.
On the Marathon mode you will sometimes cross through a mountainous area where strong winds blow away your clouds. Pause the game and listen for a few minutes. Eventually Totaka's Song will play, mixed in with the background music.